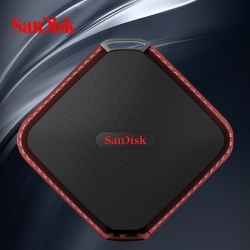 SanDisk Extreme 510 portable SSD with SSD all terrain performance portable and suitable for durability and waterproof, designed for photographers, photographers and creative professionals and design. This portable SSD really can be safely caught in your backpack, and compact design, can be easily loaded into your pocket, is a perfect companion for you the picnic, outdoor adventure or location. The capacity is up to 480GB*, and read speed of up to 430MB/s6, compared with the typical hard disk, you will transfer time can be obviously shortened, even mobile high resolution files can also be easily completed. 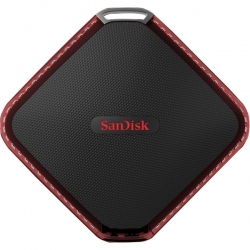 Strong waterproof SanDisk Extreme 510 portable SSD uses 128 bit encryption technology. Provide the password protection, is your important files storage necessary tools.